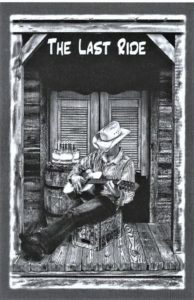 The Last Ride: I’ve always been fascinated by the integration of music and theater. Being a songwriter, I had long wanted to write a theatrical piece with my music but not in the traditional style of a Broadway musical. I began this journey by first writing character-oriented songs and then writing the plot around the music. I completed The Last Ride in 2007 but still had no idea where to go from there. When the opportunity to use the play as a vehicle to raise money for Casita Linda, a foundation that builds homes for indigent families in Mexico was presented to me, it fit right in to my personal philosophy of using my creative output to benefit the less fortunate.The play was produced in 2008 and to my pleasant surprise received critical acclaim and played to sold out audiences for its entire run. But the best part of the entire experience for everyone involved was that we were able to raise sufficient funds resulting in several houses being built for families in Mexico. I’m once again grateful to everyone involved from the stage managers to the Director to the players for donating the valuable time to make the production of The Last Ride a success.